As you can see, I did not do my Wednesday Weigh-in yesterday. I actually haven't gotten on the scale in over a week! I've been doing really well the last few days as far as my eating goes, so I'm afraid if I get on the scale and see that my weight is up from eating out all last weekend, I'll just have that "screw it" mentality. Usually, I'm pretty good about not letting the scale get to me (mentally), but right now I feel kind of vulnerable, considering everything that's been going on lately. So I'm going to give it a little more time, and then I'll do my regular weigh-ins again. August 19th will mark SEVEN YEARS since I started this weight loss journey! Maybe I'll do a big comparison post then--not just my weight, but all that has changed in the last seven years. It's so hard to believe it's been that long. While my journey is more like a roller coaster with the ups and downs, I still have to pat myself on the back for maintaining such a large weight loss for this long. It's been far from perfect, but I've still defied the odds! I took the kids to the county fair on Tuesday, and I can't even describe how tempted I was to eat all sorts of junk and then "start over tomorrow". I didn't buy ANY food there, though! I ate one of Eli's french fries, and that's the only thing I had. I was most tempted by the elephant ears--they looked and smelled so good. I probably could have gotten one, and worked it into my calories, but it was more about the mindset--I wanted to prove to myself that it was perfectly okay to go to the fair and not eat junk food. Instead, I had a piece of homemade zucchini bread when I got home. 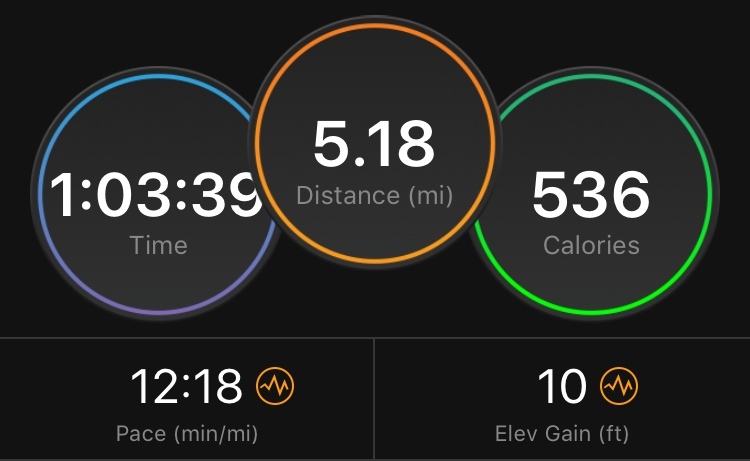 I had a hard time getting out the door to run this morning (running after a rest day is toughest for me). I procrastinated as it got hotter by the minute, and then finally headed out at 9:30. It felt so much hotter than the numbers showed, though. 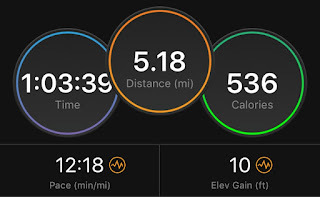 I was in the mood to run long(ish) and slow, so I could listen to a couple of podcasts. I wore my heart rate monitor to keep my heart rate low, and my heart rate was so high today! I felt like I couldn't possibly run any slower, but my heart rate monitor was beeping constantly from being too high. 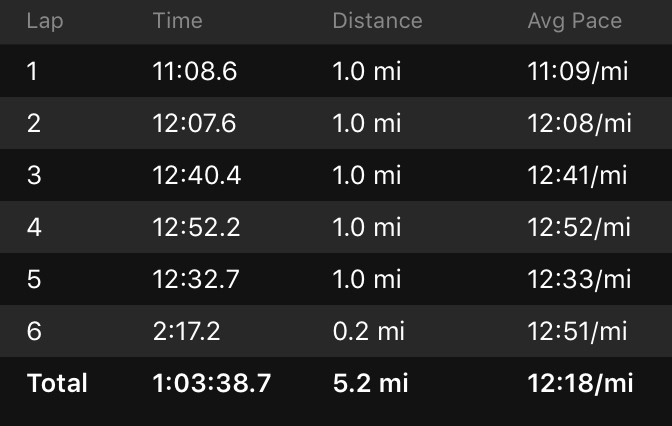 I did an out and back, listening to a couple of podcasts, and my pace was the slowest it's been since I started heart rate training in December. 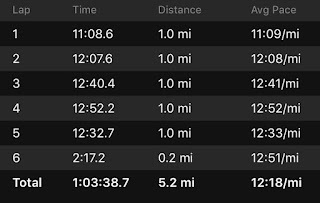 A 12:18/mile average pace, and even then, my average heart rate was 148 (I was aiming for under 146 bpm). When I got home, my clothes were totally saturated with sweat. "Reduce lung function, making it more difficult to breathe as deeply and vigorously as you normally would, especially when exercising. Breathing may start to feel uncomfortable, and you may notice that you are taking more rapid and shallow breaths than normal." That's so interesting! I've never paid attention to the air quality index before, but I'm definitely going to start. With everything going on with Chandler, I totally forgot to write about this: we officially adopted Monica! We made this decision before Chandler died. Monica is just such a sweet cat that I couldn't imagine having to give her back. I felt a little guilty about it after Chandler died, because I certainly wasn't trying to replace him. Chandler could never be replaced! But like I said, we made the decision when we thought we'd have several more years with Chandler. Tomorrow, I'm meeting Nathan for a run early in the morning. 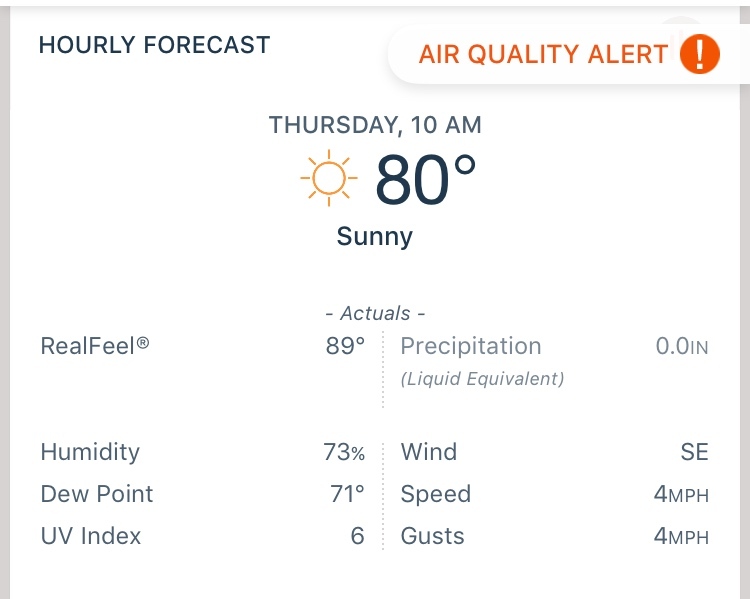 I'm planning to run at a tempo-ish pace of 8:30 or so, but if the air feels anything like today, I'll just nix that plan and run easy! The air quality alert is supposed to expire tonight at midnight, so hopefully tomorrow's run will feel easier. I had an experience in the gym today that I wanted to share. I've gained about 30 lbs from my lowest weight (which puts me at about 40 lbs above my goal weight) and have been feeling down on myself. A friend at work suggested we sign up for some races together, so we're doing the Motor City 5K, a 10 mile "beer run" at Atwater Brewing, and the Free Press International Half. I've started trying to run again, but even 2 miles at a 12:00 min pace was hard today because I've gotten so out of shape. While I was dressing in the locker room after my run, an older woman, who was struggling to get dressed asked me, "Hey honey, can you help me get my sleeves straight? My fat arms make it so hard." I helped her line up the seams on her t-shirt sleeves. Just a reminder to appreciate the body I have, that lets me run two miles and generally have the mobility to do the things I want to do with it. I know the feeling! Today, I ran with my brother and I felt like I was really struggling at a 9:00-ish pace for just 3 miles. I can't believe I ran a 10K more than a minute per mile faster than that just a few months ago! I keep reminding myself that once fall comes, it'll feel much easier (the humidity is killer). I wouldn't feel guilty at all! That happened before. It'll be 7 years for me in Dec. I too have been on that roller coaster ride with you. Two regains that I had to lose again. But I've kept most of that 178 lbs off for over 5 years and I'm proud of that. We ARE defying the odds Katie!! Pam, you've done such a great job!! Sounds like what is called fried bread dough in NY. I've also heard them called fritters. In Canada we call those beaver tails! Yup, beaver tails or "queue de castor" in Quebec. They're often topped with all sorts of things here, namely Nutella. Lucky for me I don't really care for them. Ohmygoodness, Nutella would be delicious on one! In Utah we call them "scones" We also make Navajo tacos with them. fried dough (with no cinnamon sugar, obviously), chili with beans, lettuce, sour cream, cheese, tomatoes. SO GOOD. I'm so happy you adopted Monica! Leave the scale alone for now and don't let it affect you. That's a great accomplishment of avoiding all that food at the fair! Avoiding the scale has never worked out well for me, so I have to be careful. I can't avoid it too long! But I think as long as I'm eating well and counting my calories, it's okay not to know the number for now. I totally understand. I've weighed every single day for 10 years and still managed to gain back 30 of my 100 lb loss. I officially got back on the wagon on August 1st. I'm not going to weigh for a couple of weeks. I know I'm doing the right things, and I don't need the disappointment of even a half pound gain right now! Katie, I just watched the documentary and loved it. Congratulations. Very inspiring. First time, I comment on a blog! Not getting on the scale has never worked for me either. Usually if I stop weighing myself by the time I get back on the scale I'm up 10 or 12 pounds. I've been pretty good this summer about watching my weight, and although I'm up - about 3 lbs - from my pre-summer weight, I'm feeling great that I haven't done the freefall gain that has been my norm for the summer months. We are here visiting my mom until this Thursday and then our eating out season will be over!! !